The integrity of the anterior teeth is very important for the majority of people. In addition to the functional aspects, aesthetics play a particularly decisive role. This is especially important for the central maxillary anterior teeth due to their prominent position. In this practice-related specialist article the authors describe their procedure with an all-ceramic restoration and demonstrate why each case should be assessed individually before beginning treatment. The attention of researchers subsequently turned to the development of gingivacoloured materials which can be modelled inside the oral cavity, provide for customised shade matching and permit adhesive attachment to the dental hard tissue. Today it is therefore possible to restore exposed dental necks with light-curing composites which can be individually matched to the colour and texture of the gum and thus help to lend well-balanced proportions to the teeth. The author shows how the highly aesthetic restorative material Amaris was used to treat the clinical case of a 15-year-old patient, who presented with an uncommon example of tooth fusion (synodontia) of the maxillary incisors 11 and 12 and, respectively, 21 and 22, including a diastema. 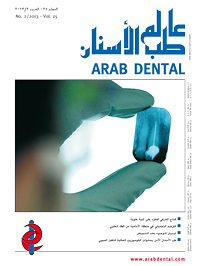 Nowadays when dentists select a material for restoring a case aesthetically, they also expect easy handling of the filling material and a high-lustre surface resembling the enamel surface in addition to good physical properties and biocompatibility, which is indispensible with any material in clinical use. The author demonstrates the use of a biocompatible composite in a clinical case: a patient presented with an acute complaint on tooth 16. Following successful endodontic treatment under a microscope and removal of the old composite filling and secondary caries, there was only a little structure remaining on tooth 16. The molar was then restored optimally using high-quality composite almost without further loss of tooth structure. With angled and casted abutments the authors improved the initial situation and corrected the angle of an implant slightly, but did not solve the whole problem, especially the esthetic part of it. In a clinical case, all kind of abutments were tried to choose the best angulation correction. Neither one fulfilled the esthetic parameters. So new IPS e max press abutments were customized and cemented onto the Titanium base abutment by using a dualcure resin cement. The authors show the fabrication procedure step by step. From a dental medical point of view healthy white teeth are considered the ideal of beauty, whereby tooth whitening, or bleaching, is becoming increasingly important. Any existing conservative or prosthetic restorations are not whitened along with the bleaching but retain their original shade and may even be damaged. The aim of this article is to illustrate the clinical procedure with intraoral replacement of a veneer for correcting the shade of the restoration using an all-ceramic veneer following prior bleaching of the natural teeth.